(Reuters) - A work crew began to dismantle a Confederate monument in Louisville, Kentucky on Saturday, the mayor said, in the latest move to take down or relocate symbols of the slaveholding Southern Confederacy from the American Civil War. 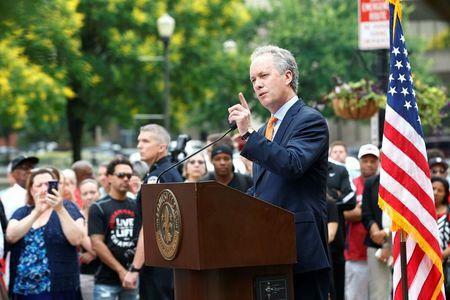 Louisville Mayor Greg Fischer in a pair of messages on Twitter showed photos of figures that had been removed from the monument. "We've started disassembly (of) the Confederate Monument," Fischer wrote. The 121-year-old memorial will be moved from its current location adjacent to the University of Louisville to the town of Brandenburg, a town about 40 miles (64 km) southwest of Louisville that hosts a biennial Civil War re-enactment, officials have said. Fischer said earlier this week that the Brandenburg location provides a "more proper context" for the monument, which is 70 feet (21 meters) tall. Chris Poynter, a spokesman for Fischer, said in an email on Saturday the work of dismantling the monument will continue for several days. Students and staff members at the University of Louisville had said the memorial condoned slavery. Kentucky was a slave state that did not join the Confederacy. Many Kentucky residents, however, fought for the South, which was ultimately defeated by the Union forces of northern states. Confederate symbols have been removed from a number of centers of civic life in the United States over the last two years following criticism that the displays foster racism. The Washington National Cathedral said this year it was removing Confederate battle flags from two stained glass windows honoring Confederate Generals Stonewall Jackson and Robert E. Lee. Last year, the Confederate flag was removed from the grounds of the South Carolina state capitol, which was one of the most prominent placements for the flag, following the massacre of nine black churchgoers in Charleston. The man charged with the murders was seen in photographs posing with the battle flag carried by Confederate soldiers.